Supporters of Ed Miliband were left fuming after the Daily Mail repeatedly published claims about his father, notable Marxist philosopher Ralph Miliband, and how he ‘hated Britain’. 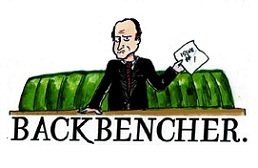 While the Mail got a severe slapping down from the Left, a few senior Labour activists and members took their revenge one step further, nudging angry twitter users towards the address of Paul Dacre, the Editor of the Daily Mail. John Prescott tweeted a link to a website which asks: Where is Paul Dacre? This was soon followed by a fellow twitter user tweeting Dacre’s home address and tweets from other senior sources to ‘go to his house instead’. 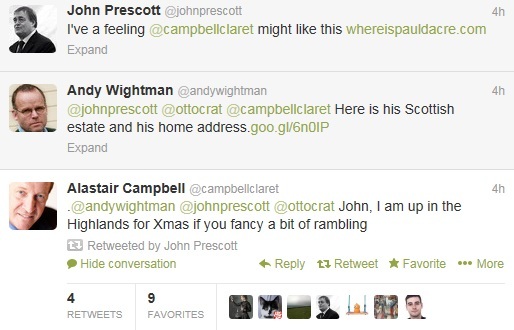 Alistair Campbell then publicly replies to Prescott’s tweet, drawing attention towards it, as well as making geographical reference which matches Dacre’s home location. While Labourites have every reason to be angry about the Mail stories which aggressively attack Ralph Miliband, posting the Mail Editor’s address and encouraging a twitter mob to visit his house is certainly a morally questionable response.